ONO Design Monster linen - it's anything but frightening! ONO Design Monster linen – it’s anything but frightening! What’s black and white, covered in monsters but doesn’t say boo? 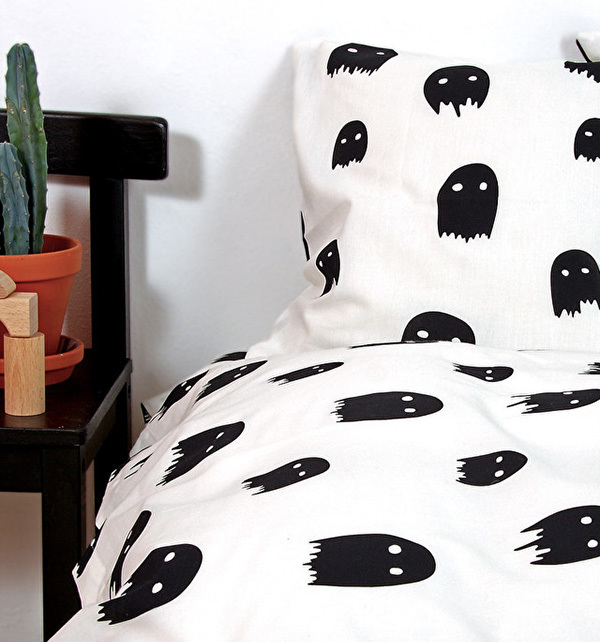 It’s this wonderful Monster bedding set from ONO Design and does it ever make my monochrome loving heart sing! The perfect bedding for any monochrome themed nursery or bedroom, Denmark’s ONO Design has created the ultimate linen set for monster loving kids with their Monster Bedding. A comfortable sleep is to be expected in this lush linen set made from 100 per cent organic cotton and printed all over with black monster silhouettes, expertly illustrated by the talented Nanna Asmussen. Lucky for us, we can find ONO Design Monster bedding locally – and if you’re quick, you can nab yourself these awesome sale prices – baby size set, $52 and a junior set, $68.80 at Growing Footprints.